Jicama is so fun to work with. It’s crisp and clean and plays really well with other foods. 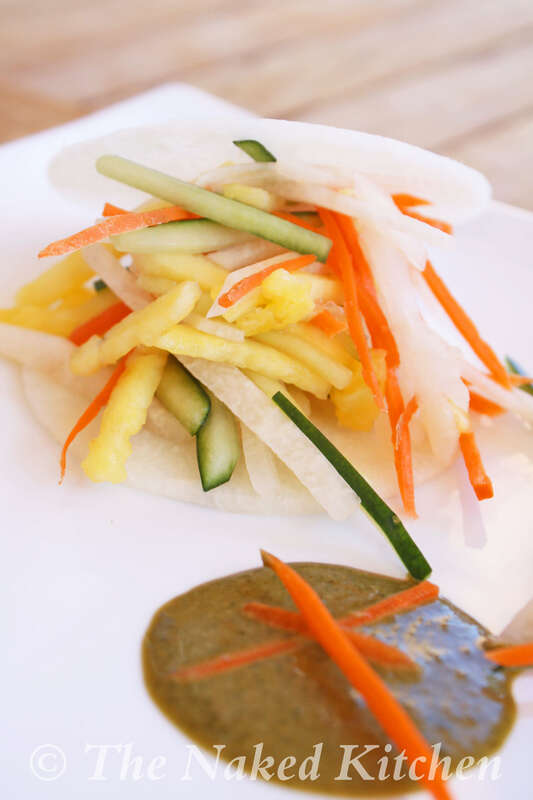 Some of jicama’s friends, carrot, cucumber and pineapple came over to play so here they are all stacked together with a kickin’ dressing that is bright and fresh. Come join the party! Peel the jicama and cut in half horizontally. Cut 8 thin slices from the widest part of the tuber and set aside. Julienne the remaining jicama. 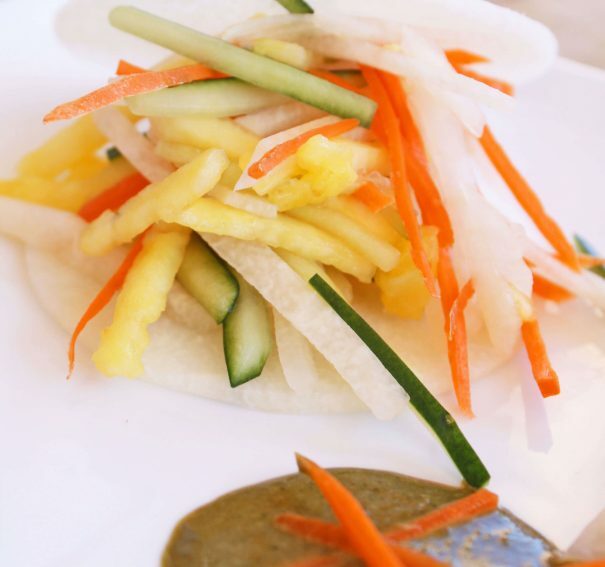 Lightly toss the jicama, carrot, cucumber and pineapple in a bowl. Heat a small skillet over medium high heat and add the coriander seeds and toast until fragrant about 2-3 minutes. Remove from heat and let cool. Place in a spice mill or coffee grinder and grind. Transfer the ground seeds to a blender along with the 1/4 cup pumpkin seeds and the remaining ingredients. Blend until smooth. Toss the vegetable mixture with the dressing. Place 4 slices of jicama slice on 4 serving plates and top each with a handful of the vegetables. Top with remaining slices of jicama. Garnish with remaining pumpkin seeds. Store leftovers in a sealed container for 1-2 days.